2. Profiling of Flavonoids, Carotenoids,ABA and GA by HPLC, UPLC. 4. Gas-Chromatographic analysis to find out the fatty acid composition. 8. Peptide mass and protein sequence identification by using Matrix science- Mascot database. 15. Hybridization techniques for rice and cotton (Crossing and Selfing techniques). Packages: MS OFFICE XP (Word, Excel, Power point and publisher), Adobe Photoshop, CorelDraw, and Windows Moviemaker. Scientific Tamil (Ariviyal Tamizh) essay writer. GPNL-2014-1062: Exploration of genetic diversity among medicinally important genus Epimedium species based on genomic and EST-SSR marker. Natural Products Research (2014). AAAS_2014_34743573: Association Analysis of Yield and Fiber Traits in Advance Pakistani Upland Cotton Cultivars (Gossypium hirsutum L.). Acta Advances in Agricultural Sciences (2014). J.7879-93: "Genetic Architecture of Fiber Yield, Quality and Physical Seed Traits in Colored Cotton". Journal of Agricultural Science and Technology (2014). JPBCS 30.05.14-0464. Study of heterosis and combining ability in Genetic male sterility based diploid cotton hybrids for yield, yield component, fibre quality characters and oil content. Journal of Plant Breeding and Crop Science (2014). IJGMB 03.06.14-0103: Combining ability and useful heterosis for yield and fibre quality traits in line x tester crosses of upland cotton. International Journal of Genetics and Molecular Biology (2014). TGGE-D-13-00064: Genetic relationships among a collection of Musa germplasm by Fluorescent Labeled SRAP. Tree Genetics & Genomes (2013). GJAS062113683: An assessment of bean variety adopted and seed quality survey in selected areas of SNNPR, Ethiopia. Greener Journal of Agricultural Sciences (2013). JMMO2595R1: Binding mechanism between Hsp90 and Sgt1 explored by homology modeling and molecular dynamics simulations in rice. Journal of Molecular Modeling (2012). AJAR-11-2077: High temperature induced fertility transition and anther carbohydrate metabolism in canola recessive genic male sterile line. African journal of Agricultural Research (2011). ARJ-11-121: Allelic diversity of Saltol in a set of rice genotypes using Saltol linked microsatellites. 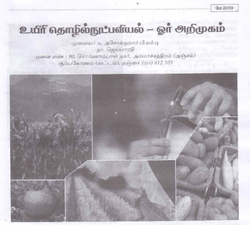 Agricultural Science Research Journal (2011). IRJAS-11-021: Molecular Ecology of genetic diversity of cacao cultivated in the south-east region of Nicaragua. International Research journal of Agricultural Science (2011). IRJPS-11-026: Correlation, path-coefficient and genetic diversity in lentil (Lens culinaris Medik) under rain fed conditions. International Research Journal of Plant Science (2011). J. 221-89: Genetic Studies in Upland Cotton (Gossypium hirsutum L.) I. General and Specific Combining Ability. Journal of Agricultural Science and Technology (2010).